On Sunday, the USC women’s basketball team clinched its first NCAA Tournament bid since 2006 by winning the Pac-12 Tournament championship. The Women of Troy won four games in four days, something that had never been done before in the history of the conference tournament. Cooper-Dyke’s praise for her players is well-deserved. Two weeks ago, this was a team whose NCAA Tournament bubble appeared to have burst after three consecutive losses, including back-to-back home losses, which dropped its record to 16-12. For a roster full of players who had never played in the NCAA Tournament and had very little postseason experience (save for senior forwards Cassie Harberts and Desireé Bradley, who played on the 2010-11 team that advanced to the finals of the women’s NIT), nobody could have expected the Women of Troy to rally from such a deep hole. But that’s what’s so special about college basketball this time of year — something improbable happens that no one saw coming. USC came up short in the tiebreaker with Arizona State for fourth place, meaning the team wouldn’t get a first-round bye in the conference tournament. This might have been a blessing in disguise, however, as the team eked out a closer-than-expected 59-54 win over last-place Arizona. The close victory would serve as an indicator of things to come. 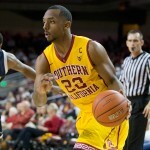 USC edged out ASU in the next round 59-57, setting up a semifinal showdown with No. 4 Stanford. The Cardinal are among the most dominant teams in women’s college basketball in recent years, with five Final Four appearances in the past six seasons. From the opening tip, however, USC was every bit Stanford’s equal. After playing the first half to a 32-32 tie, the Women of Troy were the better team coming out of the locker room, building a 10-point lead with just under 11 minutes left. 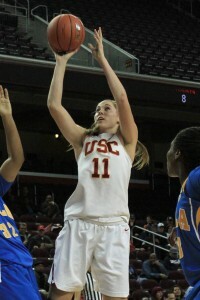 After Stanford stormed back to take a 60-57 lead with five minutes left, USC leaned on its best player — Harberts. Harberts scored the next 10 points of the game and gave the Women of Troy a commanding 67-60 victory that held up, sending the team into a frenzy and leaving the Cardinal stunned. The celebration continued into the next night, as USC topped Oregon State in the finals and hoisted the trophy. When Cooper-Dyke praises her players’ toughness, Harberts must be the first one that comes to mind. As a freshman on the 2010-2011 team, she started every game and got a taste of what March Madness is supposed to be like, thanks to the team’s run to the WNIT finals. What followed, however, was disappointment and underachievement. 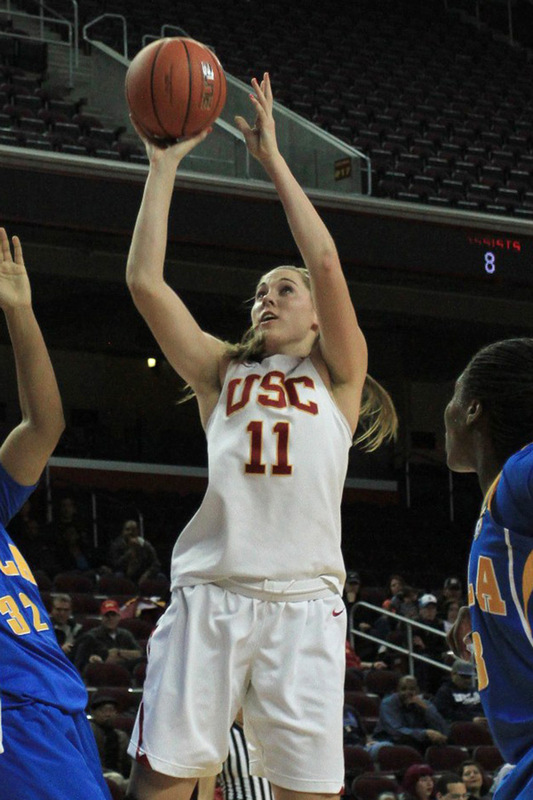 USC seemed poised to make the tournament in her sophomore year, but had an unimpressive regular season and was upset by Washington State in the first round of the Pac-12 Tournament. Last year, the team lost to Cal in the Pac-12 quarterfinals on March 8, 2013 to finish the season 11-20. Five days later, Michael Cooper resigned as head coach, leaving the program in disarray. After enduring such turmoil, it’s fitting that Harberts was the one to lead the team in the most crucial of moments, and she is very deserving of any praise she receives. 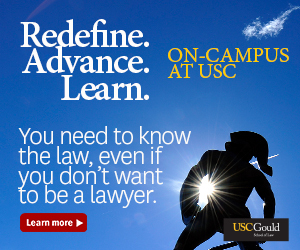 But the driving force behind USC’s surprising success is undoubtedly Cooper-Dyke. Anyone who follows USC’s men’s team knows that rebuilding projects are not easy. Last year, the women’s team finished 11-20 overall and 7-11 in Pac-12 play. This year, the Women of Troy are 22-12 and 11-7 in conference games. This type of turnaround is the exception, rather than the rule, for teams with first-year head coaches. Considering what Cooper-Dyke went through to get her “dream job” makes this success all the more impressive. After a decorated playing career in the WNBA, Cooper-Dyke coached at Prairie View A&M, UNC Wilmington and Texas Southern, places not exactly considered marquee coaching jobs. She found success at each stop, but she always wanted something more, and it appears that she’s found it now that she’s returned to USC. Cooper-Dyke and the Women of Troy shocked everyone but themselves with this tournament championship, and now that their ticket to the Big Dance has already been punched, the only question to ask now is simple — how much further they can go?